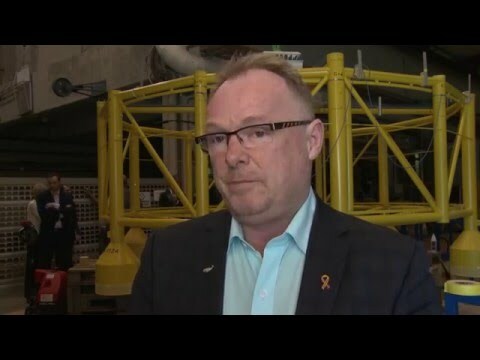 Per Sandberg, Norway’s Minister of Fisheries, will put a major effort into getting the Ocean Space Centre going before 2023. The minister made this quite clear after an information-packed visit to MARINTEK that was hosted by MARINTEK itself, SINTEF's Group management and SINTEF Fisheries and Aquaculture. There is cross-political agreement, as there has been for several years, that the Ocean Space Centre is going to be realised. The challenge lies in the amount of time that this will take, and I believe that a number of politicians need to have a chat with the Ministry of Finance." "Will you act as the agent to have this decision implemented more rapidly?" "Yes, I will. For me, as one of Norway's least patient politicians, 2023 would be far too late." "Norway has played a leading role in aquaculture for many years. What needs to be done to maintain this position in the future?" "There are several factors involved here. First, there needs to be cross-political agreement that we do want to maintain this position. Then, the fact that we have the sea at our doorstep, as it were, is our greatest advantage. We also possess a high level of expertise in the petroleum industry, which can now be converted for applications in aquaculture, industry and fisheries." Prognoses for the aquaculture industry suggest that value creation will increase by a factor of six by 2050. The minister believes that this rate of growth is essential if we are to produce food for an ever-growing population. At the same time, he is aware that this must take place in a sustainable manner. "One thing is that we will need to produce perhaps six times as much food from the sea in the future, but we also have to sell it. If the reputation of Norwegian seafood suffers damage, everything will come to a halt, and I believe that the aquaculture industry understands this perfectly well. I meet powerful forces out there that want to invest, but to do so in an environmentally responsible way. It is precisely because they realise that if Norway is unable to solve the problems of salmon lice and disease, we are not going to get anywhere," says Sandberg. On January 27, 2015, the Ocean Space Centre passed yet another political milestone. The background to this landmark event is that in October 2014, Norway's Minister of Education and Research Røe Isaksen laid a key research policy document, the Long-term Plan for Research and Higher Education before the Storting. In this document, the government determined that two R & D buildings will be allocated the highest priority in the immediate future: the Life Sciences Building at the University of Oslo and an upgrading of the Marine Technology Centre in Trondheim to become the Ocean Space Centre. Pupils at Blindern High School who won the Ocean Space Race in Trondheim were so delighted by their victory that they are thinking of becoming naval architects. The 1st Ocean Technology Summit took place June 4th 2013, during Nor-Shipping 2013. The conference proved to be a huge success, both in terms of the chosen topics (green shipping and arctic challenges) and the number of participants. Model tests of the world's first battery-driven, autonomous container vessel are currently under way in the Ship Model Tank at SINTEF Ocean. The vessel will be ready for launch in eighteen months time.